The World, Residences at Sea will launch The World Nobel Laureate Lecture Series in September 2017 when 2014 Nobel Prize winner in Physics, Dr. Shuji Nakamura, speaks on board about inventing the blue LED (light-emitting diode). The new program will bring four esteemed Nobel Prize Laureates to the Ship annually, one per quarter, to lecture on topics in their respective fields such as medicine, economics and science. Working in conjunction with two of the Ship’s Residents who are serving as Program Ambassadors, the series will offer The World’s Residents the opportunity to personally connect with and learn from internationally-renowned Nobel Prize Laureates. The World will welcome Dr. Nakamura as debut guest speaker when the Ship visits Santa Barbara, California in mid-September 2017. Following his lecture, Dr. Nakamura will be hosted at a black-tie reception and dinner in his honor. 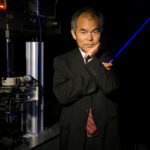 A Japanese-born American scientist and inventor in the field of semiconductor technology, Dr. Nakamura is Professor of Materials and Electrical & Computer Engineering at the University of California, Santa Barbara. He was awarded the 2014 Nobel Prize in Physics for inventing the efficient blue LED, which has enabled long-lasting, energy-saving sources of bright white light. The World Nobel Laureate Lecture Series complements the Ship’s bespoke onboard lecture program which enriches Residents’ intellectual exploration at the highest academic levels. Special guests speak on a variety of topics such as history, culture and business that are designed to “bring the journey alive” and that are pertinent to the countries the Ship visits. Residents have often commented that living on The World is like getting an advanced degree while traveling the globe to more than 100 ports of call annually.